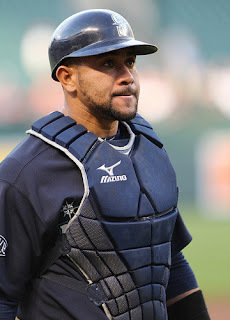 Mariners Latest: O-O-Olivo, The Right Stuff!!! With a game like this it's pretty hard not to be totally ridiculous with the title. If any of you remember the horrible boy band and the original New Kids On The Block, that was one of their hits. Not sure how many 30+ girls read the blog though. Miguel Olivo came through big for the M's tonight with a homerun in the 8th inning to make it 4 - 2 and what looked like what was going to be a sure win for Jason Vargas. Instead, Jamey Wright came in with a different gameplan than the rest of the team giving up two runs on yet another Carlos Quentin homer, his second of the game and third in two days. The M's stretched the game into the tenth where Justin Smoak led off the inning with a double, Adam Kennedy walkedon four straight pitches and once again, Miguel Olivo came to the plate. On a first pitch fastball Olivo pulled a hot grounder down the line, just fair to score both Wilson (pinch running) and Adam Kennedy. As of late, Miguel Olivo has some sort of super hero syndrome in the late innings. After Halman laid down a sac bunt to move Olivo to third, Gutierrez followed with a bunt of his own with Olivo powering down the line. SQUEEZE!!! Executed perfectly, the M's took the lead 7 - 4. That was the final as Brandon League came into the ninth for his 17th save. That breaks a ten game losing streak in Chicago at U.S. Cellular Field and keeps the M's from getting swept. It also is the first time in 10 games that Paul Konerko did not hit a homerun against the M's in the windy city. That's a huge monkey off the Mariner's backs as we head to Detroit for a four game series. Quite a night for Olivo and the Mariners. After Wedge's pep talk with a few of the veterans, it seems that the same few are the ones that came through tonight. Smoak, Guti, Olivo, Kennedy. However, Ichiro seemed to have a different approach at the plate tonight, hitting the ball hard three out of four times but remaining hitless. Figgins, he looked the same, getting a hit tonight but not when he was needed. He also had a half hearted attempt at a ground ball that went under his glove on a backhand. It was considered a hit. The worst part of this is that Figgy took off his glove and started tightening the strings as if his glove had something to do with it... he didn't get a glove on it for that to be a factor. So bring on the Motor City Kitties. Let's hope our pitching gets back on track and our offense is as it was in Safeco. LET'S GO MARINERS!!! !